It’s 2015, and of course your business is on Twitter. You follow the rules of modern digital marketing, look for a good balance of informative tweets and advertising, and stay engaged with your customers. But is your Twitter strategy stranded in a silo? Good Twitter metrics means more than just your follower numbers. Five years ago having a social account at all was enough for most companies, but in today’s data-driven world it’s critical that you collect information about your Twitter presence, monitor it to create opportunities for insight, and share it with the colleagues who can help you do better. Think about all of the people who contribute to the success of your company’s social media strategy, from Creative to Marketing to the Sales team. Are you sharing your dashboard with them, and if so are you providing the metrics that will make their jobs easier (and in turn, make your job more successful)? If your social strategy for Twitter is entirely advertisements, you’ll have a hard time developing an audience. On the other hand, just sharing funny jokes will get you attention, but it won’t be profitable. Try creating a report that monitors how your followers are interacting with tweets that feature links. Are they visiting your website, sharing it with colleagues, or just clicking Like? This is a good tile to share with your Creative team to make sure your content highlights are inspiring the right action. A good hashtag can be a way to sort information, create viral buzz, or even make a 21st century joke. A bad hashtag, on the other hand, is just a waste of your precious 140 characters. 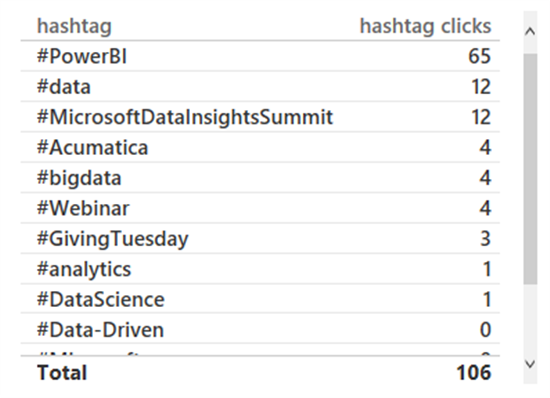 Keep track of which hashtags resonate with your audience and inspire clicks, and which just aren’t grabbing attention. Share this information with Marketing so they know what your followers are interested in and which tags need tweaking. One of the poorly kept “secrets” of social media is that just increasing your number of followers is easy. Increasing it with quality followers, on the other hand, is more difficult. Try creating a scatter chart to quickly see how active your audience is and whether the bulk of your tweets are being read and engaged in equal measures. Share this information with your Sales team: a strong engagements to impressions ratio is a sign of an active customer base. These days the success of a Twitter strategy relies on more than just one Social Media Manager. Your social presence is a combined effort across the company to create compelling messaging, grab attention with visual media, and turn curious browsers into eager customers. Make sure you’re tracking the right Twitter KPIs, and don’t forget to share your dashboard metrics with all company contributors. Need to rescue your Twitter metrics from the silo? Follow these instructions to see the above reports with your own Twitter data! Go to analytics.twitter.com. You may have to log in to your Twitter account. Click on Tweets in the Twitter main menu, and then click the Export data button in the top right of the screen. Save this file to your computer and rename it to “twitteractivity”. Click on the Edit Queries button. Right click on Twitter File Path and select Advanced Editor. Replace the existing Source with the file path where you saved your analytics (for example, “C:\Users\SampleUser\Downloads\Twitter”). Click Done. Close & Apply the changes. The three visualizations will update to reflect your Twitter analytics.